Despite shaking the box as recommended to distribute the pieces evenly, my first bowl of this cereal contained absolutely zero cookie pieces. 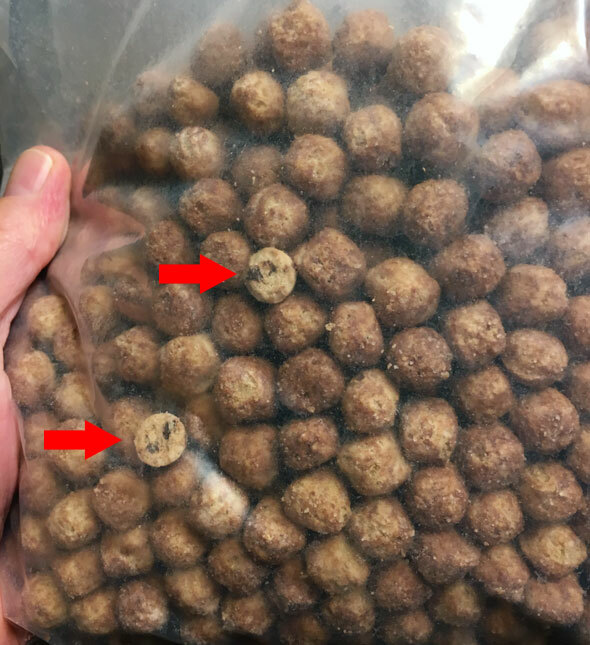 My second bowl of Keebler Cereal contained 4 cookie pieces and they were dominated by and mostly hidden by the other cereal pieces, so the flavor and texture of the cookie pieces went unnoticed. If you separate out the cookie pieces and try them by themselves, they do taste interesting and somewhat cookie-like. So, it's a real shame that this deceptive cereal offers what seemed to me as 1 cookie piece to every 25 round pieces. The milk left at the end of a bowl of cereal is not chocolate milk. What you end up with is a dusting of brown powder on top of white milk. You might call it chocolate scum. I doubt that I will finish this box of cereal. 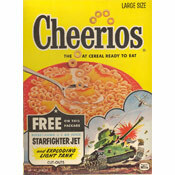 However, it was a big favorite with my three-year-old daughter who is only allowed such sweet cereals once a week. I like Keebler cookies. 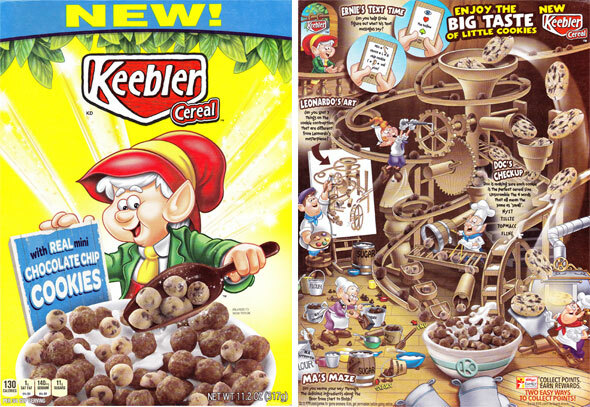 But if I worked at Keebler cookies, I would be very upset with Kellogg's cereal division for producing this disgrace to the good name of Keebler cookies. Nutritional Considerations: Each 3/4 cup serving of Keebler Cereal contains 130 calories, 3.5 grams total fat (1 gram saturated fat and 0 grams trans fat), 0 mg cholesterol, 140 mg sodium, 24 grams total carbs, less than 1 gram dietary fiber, 11 grams of sugar and 2 grams protein. 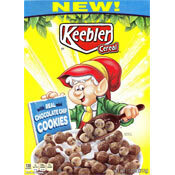 What do you think of Keebler Cereal? I'd stay away from this one. It's pretty bad. Has a taste that stays in your mouth long after the bite - like a chemical with bitters.